The passengers screamed as the bus ploughed into the back of a truck. When it finally came to a stop, the back of the truck had been crunched to where the first five rows on the left side of the bus were supposed to be. "There was a strong smell of gasoline and I was afraid that the bus would explode at any moment," she recounted the incident to Chinese daily Shin Min Daily News. "We let the children get out first before escaping ourselves." 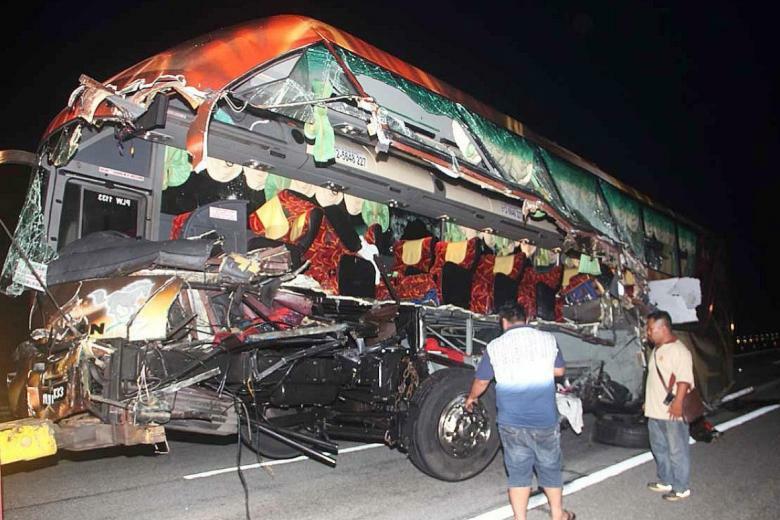 Three people died and 14 were hurt in the bus crash in Malaysia. Fourteen others, including Madam Zheng's family and their maid, were injured. The coach, operated by Singapore's Grassland Express and Tours, was en route from Kuala Lumpur to Singapore. Madam Zheng said her family, including her nine-year-old son and seven-year-old daughter, had gone to Ipoh to visit her family on Aug 31. Mr Tan Boon Huat, the director of Grassland Express and Tours, drove Madam Zheng's family back to Singapore after the accident. "My goal is to give each passenger a safe and comfortable journey, but the accident has torn several families apart," he said. "I feel guilty. This is an eternal stain on my conscience."